When we tell people that we spend our whole day outside, they often wonder what it is that we do. "Everything that we want to," is a common response. For Trollskogen, being outside is a reward itself; that is, we take pleasure in the freedom of space and fresh air. As teachers, we bring tools and provocations, but children are invited to partake in these experiences, rather than required. Of course, we have a schedule to our day, a rhythm and ritual to how we move through the Reservoir. A typical day generally follows a similar journey. 9:45AM: Arrival at the Reservoir. The children and teachers pull the cart to our base camp deep in the woods, where we work together to lay out our ground mat, blankets, set up a tent (on cold or rainy days). Backpacks come off, and are lined up, away from where we sit. Children gather to discuss their intentions for the day. 10:00-11:30AM: Exploration, free play, purposeful play. This is our first block of time, where children are invited to explore special paths and parts of the forest. Perhaps we'll take a walk to the beach to spot Canadian Geese, or head to a climbing tree. Some children might prefer setting up a balancing beam in the camp, or working with climbing ropes. We might ask a child who is interested in literacy to help write the day's snack menu. 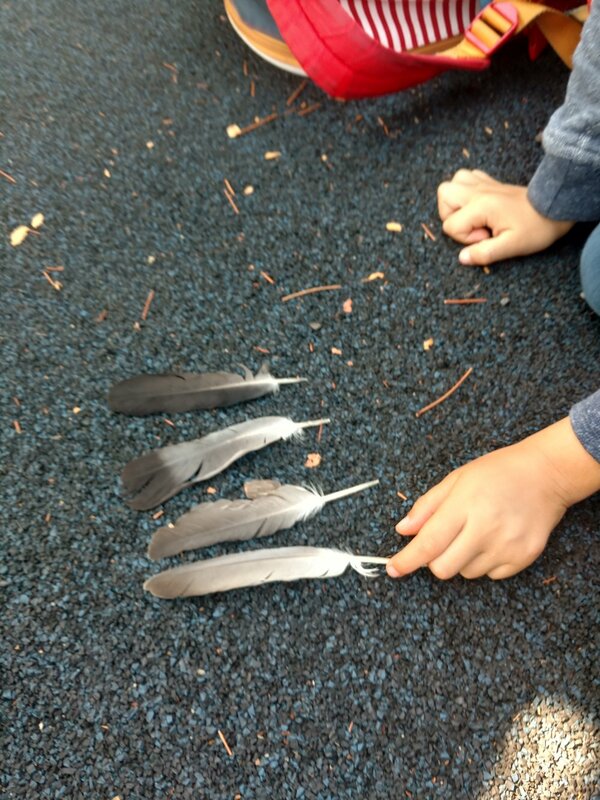 Children and teachers work together to find meaningful moments in nature. 11:30-Noon: Tea time. One of our most magical rituals is tea and snack. While the strawberry and hibiscus tea is passed around, so are treats that we've brought from school, a vegan oat cake, dried seaweed, nuts and fruit, fresh hummus. Since the families are signed up to bring snack for the whole week, the children take pride in telling others about what they bought. 12:00-1:15PM: Observation, reflection, free play. Children go off again, full of energy, to a place they want to discuss with a teacher and small group of friends. They might choose to talk about a new finding, or discuss how their familiarity with the place has changed their initial impressions. We teachers document these observations, and will later invite children to reflect more upon them after we return to school. Children also have the opportunity to play more; however, we notice that often, the children choose to draw, play with some of the games we bring, or paint using natural materials. 1:30PM: Return to school. We pack up our wagon, being sure to leave no trace, On our way out, we try to pick up any additional trash that is found, the children taking care and attention to the ground and shore. We board the bus, waving good-bye to the trees, squirrels, birds, and everything else that we encountered throughout the day. Everything we want to do, nothing that we don't, life in the Reservoir is one final year for these children to explore themselves and their environment before the academic pressures of life begin. We invite you to scroll through some of their pictures.